The new B94 is equipped with a more detailed LCD display screen, that includes watt and rpm readouts. Known for being light weight, durable and easy-to-use, the B94 has also been equipped with a new back end handle bar, making it easier to move and store. The heavy flywheel and comfortable gel seat make this bike the perfect piece of exercise equipment to own. When talking about the most popular home exercise equipment for losing weight the stationary bike will always be mentioned. Known for being light weight, durable, easy-to-use and space saving, the B94 will be the perfect piece of exercise equipment for anyone with those needs in mind. It's a fact that most bike users will tell you the number one priority about using an upright bike is being comfortable but yet challenged in the workout. 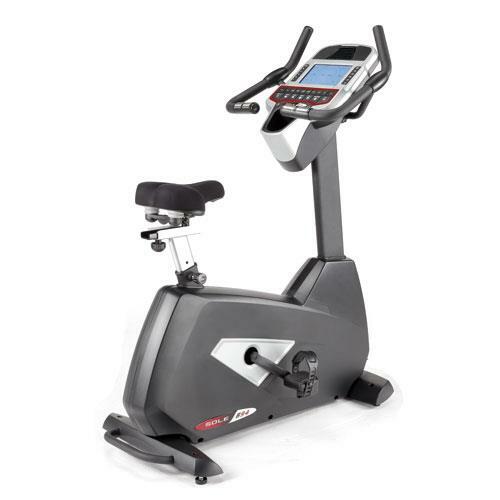 The B94 stationary bike provides both and is used in the comfort and convenience of your own home. The adjustable gel seat, strong frame and ergonomically designed pedals allow for the machine to conform itself to you instead of the other way around. The B94's straight-forward programs and 9" LCD display will also provide users with fast effective fat burning and cardio exercises, helping you to spend less time worrying about gimmicky programs and more time focusing on reaching your goals. There are 10 challenging programs to choose from, everything from Hill to Heart Rate Control the B94 will help you find your workout. It's also great for those just starting out and others who are training, feel free to design your own programs using our User Defined feature. It's time to start making this a reality. Height(in. ):	55" Length(in. ):	44" Width(in. ):	23" Item Weight(lbs. ):	123 lbs. Weight Capacity(lbs. ):	325 lbs.